I have an uncle called Sione, the family calls him Son-jane. Well really he’s like my dad’s second cousin, but I call him uncle. When my dad sponsored his migration over from Samoa he lived with my grandparents in the back house. One night he tried to wake up my Nana. Sione was dressed in full drag, so proud of himself he wanted an audience. “Aua oi, go get changed before anyone wakes up”. 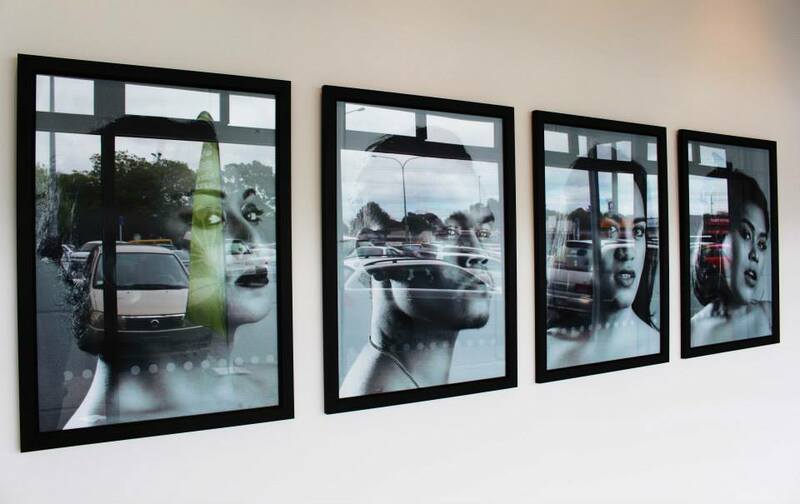 Poly Typical at Fresh Gallery Otara is concerned with the depiction of the Pacific LGBT community. The Pacific has a unique relationship to LGBT discrimination. While the role of the fa’afafine is pivotal in the Pacific community, more often than not our community’s lack of acceptance is prescribed by the lasting missionary influences on the culture. It’s easy to judge this movement as pigeonholing itself when you’re not victim to this cultural expectation. At a time where marriage equality is on the forefront of media coverage this exhibition very much typifies a movement bigger than its self. Uncanny then is how this group of artists expressing difference presents a sameness in format. This being large scale framed photographic portraits and flat screens on black walls, creating a very slick exhibition. Even more uncanny is how these aesthetic qualities mimic that of the curator Tanu Gago’s own work as an artist. The collective visual experience creates a notion of a collective lived experience. Although I do wonder if this collective lived experience actually exists. Usually not drawn to painting, I craved the shift in medium of Molly Rangiwai’s self portrait. While Molly still deals with representation of self and so conceptually is very much aligned with the rest of the exhibit, the simple shift of format provides a visual reprieve. More than that the mixed media installation of Luisa Tora operates almost tacitly as a protest. Luisa Tora’s GBTQI is a yellow knotted rope hanging from the ceiling. The title noticeably missing the L (lesbian) of LGBTQI highlights inner politics among this wider movement. In contrast to the proud self reflection of the body throughout the rest of the show, Luisa purposefully disrupts the space. Sitting to the side very much as the other, the resistance of the general aesthetic makes this work feel pertinent. Vocalising a sense of voicelessness Luisa leaves us with the most to ponder. Perhaps the most challenging work, GBTQI provides an insight in to a community otherwise masked by celebration. Yet, without the overarching quality of the exhibition, this work would never have come to life. Right place, right time. Unlike Sione, the artists of Poly Typical have a community, an audience, they even have their own ball. Their projection of identity is exciting, for this generation of the New Zealand Pacific diaspora. Decolonising notions of ‘Pacific-ism’, you can’t help but be optimistic for this proud, vibrant movement, that won’t settle for living in societal shadows. Lots of layers to the meaning and mana of this exhibition that are hard to interrogate in 500 words. Curatorial agendas are evident in most exhibitions, whether the curator is an artist or not – their position is always represented in the choices they make, what they like and don’t like. Malo Pimpi, totally agree! There is a lot to unpack in Poly Typical that unfortunately I didn’t even scratch the surface of! For me what was really immediately interesting was how we can perceive an aesthetic to represent a movement, a movement that I often think Tanu Gago’s artistic practice is at the forefront of. I then became interested with how with out such a cohesive visual curation Luisa Tora’s GBTQI would not have worked. This sophisticated overarching curation is what spoke to me and Tanu’s ability to create an environment in which multiple conceptual grounds intersect but don’t contradict each other.